Updated Tuesday October 3, 2017 by Kanata Baseball Association. 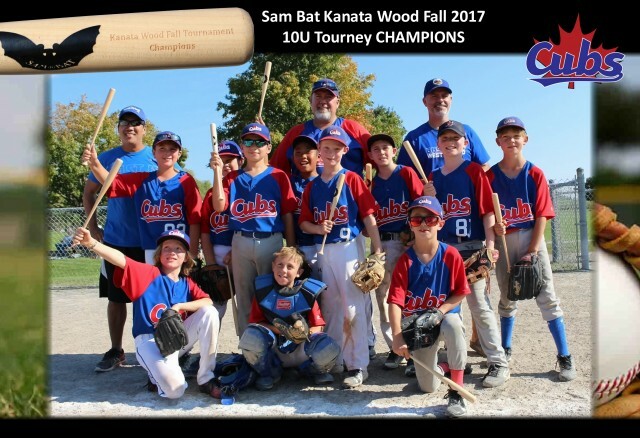 Because of the strong numbers of fall baseball participants at the 10/11U age groups, KBA decided to enter three balanced teams into its Sam Bat Fall Baseball Tournament. While all teams performed very well, one claimed the title by defeating the Quebec North Stars 8-5 in the final! Great job boys! Players: Owen Ruel, Jacob Hargadon, Logan Diffey, Joel Gervais-Perry, Jun Asparin, Liam Kelk, Joshua Madill, George Hobbins, Nolan Hobbins, Ethan Cross, and Camryn O'Gorman. Manager and Coaches: Jerome Asparin, Chad Hobbins, Ryan Hobbins (M), and Owen Kelk.